Sahyadri has spread one of its wings to the west in the Igatpuri region on which lie the forts like Kavnai, Balwantgad and Tringalwadi. The forts in this range have become easily accessible due to the construction of roads upto the hill-tops, the villages developed in this region and the frequent visits of people to this region. Although the exact period of construction of this fort is not known, however, by virtue of �Jain caves� near the foothills, one can roughly estimate the fort to be in existence since 10th century. Also there is no evidence regarding the period during which it was under control of Marathas, however, during the year 1688; Mughals took control over the fort by perfidy. As one approaches this fort through Tringalwadi village at the foothills of the fort, we come across �Pandav leni� caves. These caves are divided into three major areas viz. an outer verandah, �Vihar�, the abbey and internal �Garbhagriha�. Its entrance door is decorated with beautiful carvings on it. A statue of Lord Gautam Buddha can be seen inside the �Vihar�. Below this sculpture one can see the inscriptions carved on the stone. Three of the four pillars of Verandah are collapsed. As we proceed further towards the fort we come across a cave situated enroute to the fort prior to the beginning of the steps. Palatial remnants are seen in front as one climbs up these steps. Returning back from the palace, a way towards right hand side of the steps leads us to many dry cisterns. Moving further ahead from here for about 5 to 10 minutes, we arrive at a large cave near the foothills of the hillock lying on the left hand side of the road. About 20 � 25 persons can be accommodated in this cave. Again after a short walk ahead, we come across underground cisterns, the water of which is suitable for drinking. Pillars of these cisterns are carved with beautiful designs. The path ahead leads to the temple of Lord Shiva. Talgad/ Talegad and Igatpuri to the south; Kalsubai to the east; Trimbak range, Harihar and Basgad to the north may be seen from the brim of the fort in front of the temple. Returning back to the beginning of the steps we see the remnants of a palace in front of it. Leaving back these steps we have to move ahead and then take a right turn towards the devastated castle leads us further ahead to the secret doorway of the fort after taking a right turn from the same path, one has to climb down to reach this door. Further down step one can notice the door being carved within a single sheet of rock. On its right hand side one can see a statue of Lord Hanuman, about 6-7 feet high. A carved step on the mountain ahead leads to the top of the fort. It takes approximately 1 hour to see the prominent spots on the fort. One is expected to reach Igatpuri railway station, which is well connected by rail route from Mumbai and Nasik. After exit from the station towards the S.T. stand end, there is a junction called Ambedkar Chowk before the S.T. stand. From this junction proceed along the route towards Vagholi col which is at a 30min. of walk. After moving down the col, a left turn takes us to the Tringalwadi village within half-an-hour. Hiring jeep from Igatpuri to Tringalwadi village via Ghoti is also a good alternative to reach Tringalwadi village. 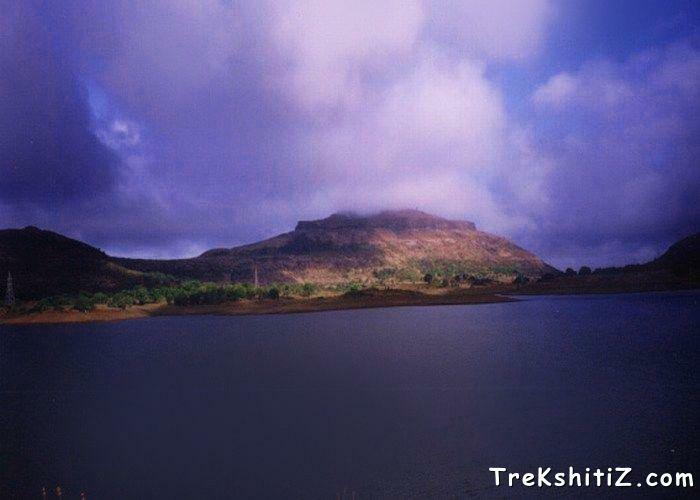 Behind Tringalwadi village lies the Tringalwadi dam. After crossing the entire length of the dam wall a road on the right leads us to the foothills of this fort. We come across �Pandav leni� as we approach the foothill of the fort. It takes about half-an-hour to reach the top of the fort. About 15 persons can be accommodated in the cave over the fort. One has to make his own food arrangement. Drinking water is available in the cisterns over the fort throughout the year. About 1 hour via Tringalwadi village.